Locally owned and operated in Anchorage, AK since 1970, Replacement Glass is Alaska’s number one provider of residential and commercial glass solutions. With more than 150 cumulative years of experience on our side and a passion for delivering quality results, you can rest assured that when you come to us for glass, mirror, storefront, hardware, or windows you’re getting the very finest products, sales, and service available in southcentral Alaska. We offer custom glass solutions for whatever need you may have. We utilize products from only top name brand manufacturers in both our residential and commercial applications. We bring more than 150 years of combined glass experience to every job we undertake. We are the largest stocking distributor of window hardware in Alaska. We maintain an A + rating with the BBB Northwest – Pacific. When you need glass repaired, replaced, and/or installed, trust that Replacement Glass is here to bring the industry’s very best quality and service to every job. 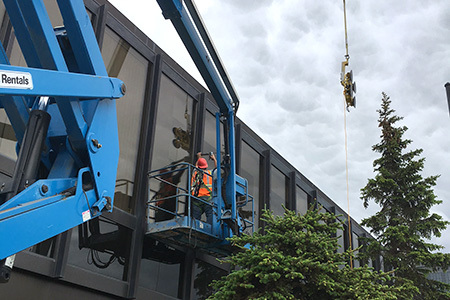 From residential double pane replacement to large crane assisted commercial windows, Replacement Glass is southcentral Alaska’s premier glass provider.